AS part of Barack Obama’s “save my legacy” tour, he circumnavigated the planet – travelling in a glider powered by trained albatrosses – lecturing us on human CO2-induced global warming climate change. NOT too difficult to see the carefully selected fear-language and continuity of message used for decades by the climate crisis industry, regardless of temperature, to scare you into belief. “Global agricultural production suffered only during cold periods, including the Little Ice Age, which ended around the late 18th or early 19th century. A rather unwelcome message for the anti-CO2, misanthropic environmental movement. Global cereal (grain) production has reached record levels in 2017, says The GWPF. Credit for the increase usually goes to agrochemicals and other advanced agricultural technology. However, there are two other key contributors — carbon dioxide and climate change. World cereal production for 2017 is projected to reach 2,613.3 million tons, 5.8 million tons above 2016’s level and nearly one-fourth higher than 2008’s. Despite population growth, production per capita rose 13 percent over the last decade, from 0.31 to 0.35 tons per person. 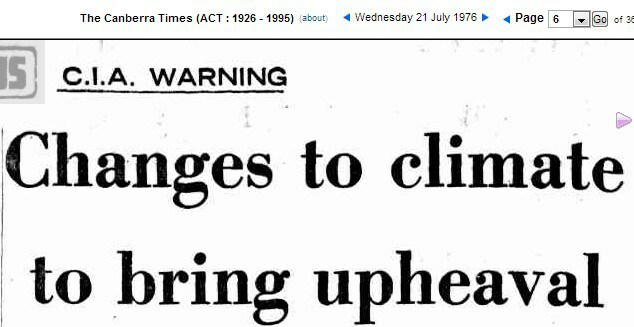 A STARK lesson in climate facts and data Vs ABC groupthink eco-ideology via “denier” numero uno – Andrew Bolt of The Herald Sun. The real “deniers” are generally not the global warming sceptics but the extremists who denounce them. Take ABC commentator Paul Bongiorno, who today denied the science in attacking Tony Abbott’s speech in London overnight. In most countries, far more people die in cold snaps than in heat waves, so a gradual lift in global temperatures, especially if it’s accompanied by more prosperity and more capacity to adapt to change, might even be beneficial. This just flies in the face of contemporary science. Actually, it’s warmist Paul himself who flies in the face of science. Then there’s the increased crops we’re getting as the world (mildly) warms. Australia’s winter grain harvest is now officially the largest for every single mainland state. The latest indications for the current season point to record cereal production in 2017 at the world level with total inventories hitting a new peak. It’s the invincible ignorance of Bongiorno that staggers me. Confronted with facts that challenge his ideology he instinctively denies them, and, indeed, went on to insult Abbott as someone he falsely claimed had said he couldn’t be believed unless he’d written it down (which, incidentally, Abbott had actually done in this case). And what of Fran Kelly? She fancies herself as someone who is pretty well informed on global warming, which she, too, spruiks. But to Bongiorno’s false claims she offered not a word of demurral. Tony Abbott says voters should beware the science of climate change but argues that higher temperatures “might even be beneficial” because “far more people die in cold snaps”. Lancet reports that more people die in the cold than the heat and Fairfax doesn’t blink. But when Abbott says it Fairfax faints. Another fake scare. No, global warming isn’t causing starvation. Global warmists have for a decade peddled the scare that global warming would kill grain crops and cause mass starvation. FRAN Kelly: Dramatic falls in staple crop production, and a jump in malnutrition are predicted across the Asia Pacific in coming decades due to climate change. . . (Dr Mark Rosegrant) . . . according to your research which crops would be most affected? Rosegrant: We’re finding that the key staples of rice, wheat and maize are going to have very large declines through most of Asia—anywhere from 15 to 25 per cent compared to a no-climate-change scenario. “The majority of the world’s one billion poor depend on agriculture for their livelihoods,” said the lead author of the new study, David Lobell of Stanford University. 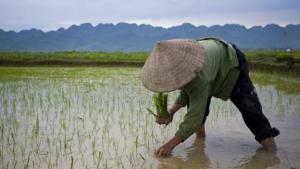 Rice is arguably the world’s most important food source and helps feed about half the globe’s people. But yields in many areas will drop as the globe warms in future years, a review of studies on rice and climate change suggests. …when the evidence from some 80 different studies is combined, the outlook is bleak, says Elizabeth Ainsworth of the University of Illinois, Urbana-Champaign. World total cereal production is forecast to increase by about 7 percent in 2013 compared to last year, helping to replenish global inventories and raise expectations for more stable markets in 2013/14, according to the latest issue of FAO’s quarterly Crop Prospects and Food Situation report. The increase would bring world cereal production to 2 479 million tonnes, a new record level. World rice production in 2013 is forecast to expand by 1.9 percent to 500 million tonnes (milled equivalent) although prospects are still very provisional. Hot, cold, drought, flood, sleet, snow, disease. Alarmists will use any climate condition to promulgate food scarcity fear and hysteria. Food security alarmism is not new. The report notes that’ “the change of climate is cooling some significant agricultural areas and causing drought in others. If, for example, there, is a northern hemisphere drop of one degree centigrade, it would mean that India will have a major drought every four years and can only support three-fourths of her present population”. “The world reserve would have to supply 30 to 50 million metric tons of grain each year to prevent the death of 150 million Indians”, the re port said. Regardless of whether it’s ‘warming’ or ‘cooling’ the same message applies.